When cereal, toast and muffins are out of the picture, planning for breakfast can be hard. Most individuals consume a carb-heavy breakfast. Waffles, English muffins and breakfast sandwiches are popular on menus and in your own home. However, planning a low carb breakfast doesn’t have to be difficult. All it takes is a little creativity, a few high-fat, low carb alternatives and a little planning. Below, you’ll learn how to build a better breakfast, get some breakfast ideas for every lifestyle and find a recipe for a low carb, high-fat breakfast bowl. Planning for breakfast on keto is no different than any other meal: Focus on high-fat, moderate protein and very few carbohydrates. Your macronutrient profile should be comprised of roughly 75% fat, 20% protein and 5% carbs. When it comes to breakfast, this means eliminating any form of bread like toast, muffins or breakfast sandwiches. Then include a fatty protein source such as bacon, pulled pork or salmon. Finally, add in fats such as cream cheese, avocado or grass-fed butter wherever you can. When transitioning to a keto diet, it’s important to consider your daily lifestyle. The best keto recipes and go-to meals are always those that work best for you. For example, if you have a large family, preparing a large frittata will work better than trying to blend four different smoothies each morning. If you have a demanding work schedule, baking a dozen egg muffins at the beginning of the week might ease those hectic mornings. Below are a few tips to follow when preparing low carb breakfasts. Many high-carb recipes can easily be made keto-friendly with a few swaps in ingredients. With the growing popularity of alternative flours (such as almond flour and coconut flour), you can still enjoy your glutenous breakfast favorites. And the best part? The keto version is low in carbohydrates and gluten-free. Whether you realize it or not, many breakfast foods are naturally grain-free and keto-friendly. Scrambled eggs and bacon? Keto. Lox and cream cheese? Keto. Pairing these dishes with a side of toast or squishing it between an English muffin is completely unnecessary. Here are a few low carb breakfast recipes anyone can enjoy — without realizing they’re keto. If you constantly find yourself scrambling in the morning, taking your breakfast on the road in a to-go cup might be a suitable option. However, many liquid breakfasts like juice or smoothies are loaded with sugar and contain zero fat or protein. Instead of plain, black coffee, prepare bulletproof coffee with grass-fed butter. It’s loaded with healthy saturated fats and will keep you satiated until noon. Add collagen, chia seeds, flax and other fat and protein sources to your morning green smoothie. Instead of juice or low-fat yogurt, make a homemade chia pudding, which is loaded with fiber and fat. Need more breakfast ideas? Egg dishes are a surefire win and, below, there’s an easy low carb breakfast you’re going to love: Avocado egg bowls. Not only are avocados low in carbohydrates, they make an excellent “vehicle” for you food. Think about it: Tortilla wraps, toast and biscuits, and even the rice and beans you find in huevos rancheros, add functionality — not flavor — to your breakfast. Wrapping eggs and sausage in a breakfast burrito allows you to take your breakfast with you, rather than sitting and enjoying it with a fork. Avocados provide a keto-friendly base for your food when used as a bowl. This recipe uses avocados as the perfect breakfast bowl for your morning scrambled eggs and bacon. It takes less than 15 minutes to make and is a sure-fire way to start your morning with a dose of healthy fats — you’ll get 40 grams of fat from these two avocado bowls and only take in 11 grams of carbohydrates in the process. Plus, 8 of the 11 grams of carbohydrates in this recipe are fiber, resulting in only 3 grams net carbs per serving. For a full deep-dive on this, check out our guides to What are Net Carbs and How Many Carbs Should I Eat. These avocado egg bowls use a keto-friendly substitute for grains, using an avocado rather than a slice of toast. Therefore, you end up leaving out the grains altogether. Pair with a mug of bulletproof coffee for a high-fat, low carb breakfast you can enjoy any day of the week. PS: Looking for more meals to round out your week? There are a variety of low carb and keto meal plans to choose from right here! 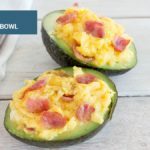 Learn how to build a better low carb breakfast, get some breakfast ideas for every lifestyle and find a recipe for a low carb avocado egg bowl. Start off by scooping out most of the avocado flesh, leaving about ½ inch around the avocado. Place a large saucepan on a low heat and add in the butter. Whilst the butter is melting, crack the eggs into a jug and beat them, adding a pinch of salt and pepper. Add the bacon to one side of the pan and let them fry for a couple of minutes on their own. Then add the eggs to the other side of the pan and stir regularly as they scramble. The eggs and bacon should both be done 5 minutes after the eggs are added to the pan. If you find you eggs are done a little before the bacon, remove the scrambled eggs from the pan and place in a bowl. Mix the bacon pieces and scrambled eggs together in a bowl, then spoon into the avocado bowls and get to eatin’! what do you do with the scooped out avocado? What happens to the scooped out flesh? Eat it. The bowl is just a cutesy idea. Mash it in with the egg and bacon pieces and fill it to overflowing and/or tip the boat over onto a sea of green and dig in! Ok..so what are my net carbs here?? Can you use uncured Canadian bacon? Hey Kelley, sure that would be fine. It has less fat and more protein than regular bacon so just be mindful if you’re watching your protein intake as well. Other than bacon and eggs…what else can you have for breakfast on the keto diet? I have a middle and high schooler and bacon and eggs are not always ideal. Hey Kim, check out our recipe blog and look at the breakfasts. There are tons of other keto friendly options besides bacon and eggs! So we just consume the spooned out avocado while we’re waiting for the eggs and bacon to cook, LOL?? I sliced the avocados and squeezed lemon juice and salt then put the eggs on top. It was very good. I only used 2 eggs, but ate the WHOLE avocado!!! oops. Are you supposed to eat the whole avacado or half? I think your calorie score is way off. One avocado is 300 cals, egg around 100 cals each, etc. How many calories are you allowed to eat each day on the Keto diet?